Aromatherapy mist spray formulas harness the powder of essential oils to heal the mind, body and spirit. Body sprays, calming sprays, refreshing room spray mists and more. Spray Mists Spray blends will keep best in a darkly colored glass bottle. Plastic sprayers are OK for short term use, however keep in mind plastic can allow essential oils to migrate out and evaporate, while leaching chemicals from the plastic into the mixture. The following essential oils can be diffused to ease the breath of a cold sufferer, or blended in massage oils to ease chest congestion. Eco friendly Oils For household tasks like cleaning, room sprays, and insect repellents you need a large glass bottle with a hand squeeze pump. You will want to increase the ratio of oils/liquid since you won't be spraying any on your skin. An excellent household sprayer can be made by repurposing a 16 fl oz dark amber bottle. You can buy a new glass bottle, but I since I get my herbal oils from from Mountain Rose anyway, I always save the bottles since they are perfect for so many things. I found through trial and error that the sprayer from a 32 oz plastic bottle fits the neck of these bottles, you just have to trim the hose a bit. Aroma Lamps: 15 to 20 drops can be used at a time in most standard sized lamps. Candle lamp bowl should be of a nonporous material, like ceramic, marble, glass or porcelain. 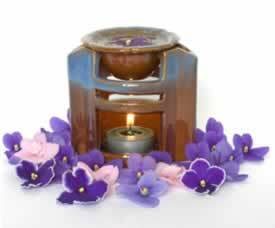 Essential Oil Blends Massage is a great way to enjoy the benefits of aromatherapy. When applying essential oils to the skin, always dilute with a carrier oil before applying. A good rule of thumb is to use 1-2 drops EO per teaspoon or 5 drops EO per tablespoon of base oil. For use on young children and frail adults you want to cut the amount of essential oils in half.A 2 percent dilution: 10-12 drops (about 1/8 teaspoon) per ounce of carrier. Oil blends change over time, some with resinous bases get even stronger. You can use many of the same oil blends you make up for massage in aromatherapy diffusers. 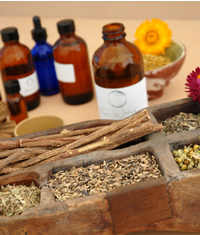 Light and heat can destroy some of the healing medicinal benefits of essential oils. Save empty essential oil bottles to store massage or synergy mixes. Most come in dark glass, 1/2 oz bottles with dropper lids.